In my early teens, I chanced upon a copy of Treasure Island, written by Robert Louis Stevenson and illustrated by N.C. Wyeth, when I was rummaging through the shelves of an antiques shop. I was immediately besotted with the illustrations. 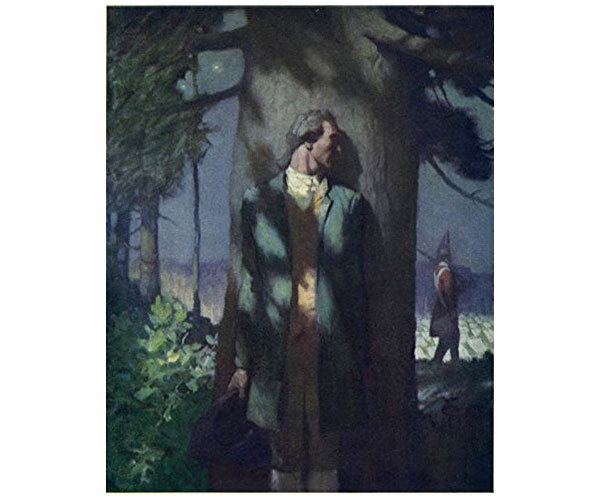 I purchased the book, went to the library to discover what I could about Mr. Wyeth, learned that he was a student of Howard Pyle’s (another artist I admire), and I was hooked. I have continued to learn everything about him and the family of artists he created. In the same article, Gopnik quotes, “In 1908, after even more commercial success as a cowpunching illustrator of westerns, he retreated into a house on a hill overlooking Chadds Ford and announced that ‘painting and illustration cannot be mixed—one cannot merge from one into the other.”’ Intrigued, I set about learning as much as I could about illustration. My forward path was paving itself before me. I am grateful for the lasting fascination sparked by the illustrations and paintings of N.C. Wyeth.